I finally got around to asking Colt to help me take photos of my finished tattoo (the outline of which I posted here). Quasi-related: In the near future, I'll be working on a round-up of ladies with geeky tattoos for Gadchick. 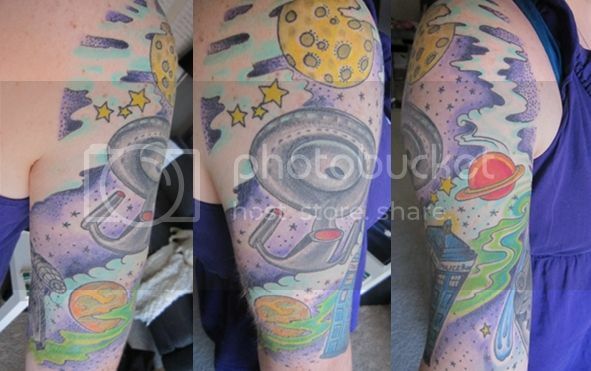 Do you have a geeky tattoo that you'd be willing to send me a photo of? Please comment or send me an email if you do! P.S.—Don't forget to enter the For the Love of Books giveaway by Feb. 29! And join the 30 Lists project, if you're so inclined. Love the TARDIS... amazing work! 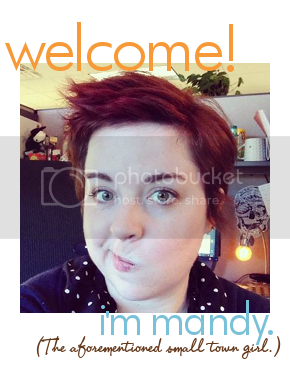 Looks amazing Mandy! I've got a maths tattoo and I'll see if I can get a decent pic of it. Sooo awesome, I love the colors! Thank you! Color makes me happy, so I'm glad to have so much of it in one piece. The tardis elevates this from awesome to fuckingnfsinewifnrjnewwfnamazing!!!!11!! I've wanted a completely nerdy half sleeve (much like yours) for ages but i've never really been sure whether it would look any good on a girl but after seeing this all my doubts are destroyed! Thankyou! I'm now 100% gonna get my tattoo! So great! 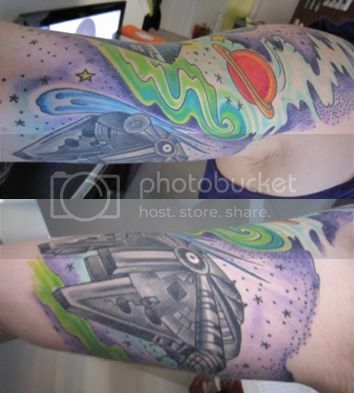 I hope you don't mind me adding your tattoo to my "tattoo inspiration" folder -- I have long been planning getting a Star Wars sleeve, am am finally consolidating all my inspiration so I can figure out exactly what I want. Your tattoo is great! I don't mind at all! I'm totally flattered. :) Thank you for the compliments! It looks so cool!I like how the red details pop out! How many sessions did it take? Thank you! It took 4 total—one for the outline (3 hours?) and 3 for the coloring (about 2.5-3 hours each, on average). It's all worth it in the end. My least favorite part's actually the first bit of healing when you have to keep it covered in Aquaphor, not the tattooing itself, haha! That may just be the most amazing tattoo I have ever seen in my life. I want to be your best friend!